In 1909, working women with the Socialist Party of America held the first International Working Women’s Day to celebrate their struggle for better working conditions in the garment industry. Today — in the Bay Area and around the world — March 8 is a celebration of the struggles of women and trans people for justice against patriarchy, classism, racism, and war. We at APEN are proud to celebrate and agitate in that tradition. How does APEN celebrate? We come together. 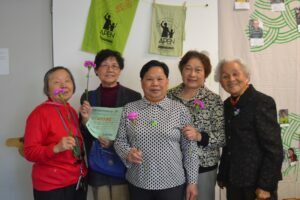 At APEN’s Chinatown office on International Working Women’s Day, approximately 30 members and staff gathered to eat, learn, garden, celebrate, and remember the women who inspire us to fight for justice for our communities. We celebrated as a community — with food, flowers, music, and a photo booth that prompted participants to write about why they choose to celebrate International Working Women’s Day and what women have inspired them. Migrant justice and gender justice are inextricably linked, because women are at the frontlines of both struggles — and as ICE tears apart families across the Bay, it’s more important than ever to know your rights and know how to support those at risk. 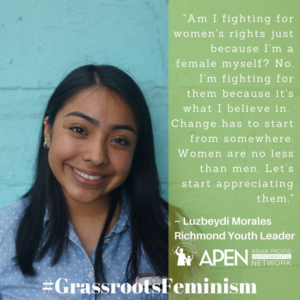 For that reason, our youth organizers came together in Richmond the day before International Women’s Day to learn about the history of IWD and participate in a Know Your Rights training. 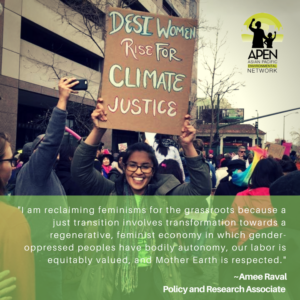 And it’s not just our members that have taken grassroots feminism to heart — APEN staff commit every day to feminist practice in our organizing. Over the next two years, APEN has committed to the hard and necessary work of reassessing our policies, structures, and practices and making sure they center those most impacted by heteropatriarchy — one of our five bold steps as an organization. Stay tuned for more, and check out what APEN staff member Amee Raval has to say below! This entry was posted in Blog, front-page-updates and tagged Chinatown, Environmental Justice, Feminisms, Leadership Development, Oakland by Jake Soiffer. Bookmark the permalink.